Will U.S.-Israel relations fray over Iran? It looks like they will, according to veteran Lebanese journalist Selim Nassar writing for pan-Arab daily al-Hayat the week preceding the world powers’ nuclear deal with the Islamic Republic. Nassar expected last Sunday’s agreement in Geneva between the 5+1 world powers and Iran to mark the fourth hiccup of note in the 65-year-old “special relationship” between the United States and Israel. The first U.S.-Israel tiff occurred under President Dwight D. Eisenhower, who compelled the Israelis to evacuate the Sinai Peninsula following the 1956 Suez War. As you know, the General Assembly of the United Nations has arranged a cease-fire in Egypt to which Egypt, France, the United Kingdom and Israel have agreed. There is being dispatched to Egypt a United Nations force in accordance with pertinent resolutions of the General Assembly. That body has urged that all other foreign forces be withdrawn from Egyptian territory, and specifically, that Israeli forces be withdrawn to the General Armistice line. The resolution covering the cease-fire and withdrawal was introduced by the United States and received the overwhelming vote of the Assembly. Statements attributed to your Government to the effect that Israel does not intend to withdraw from Egyptian territory, as requested by the United Nations, have been called to my attention. I must say frankly, Mr. Prime Minister, that the United States views these reports, if true, with deep concern. Any such decision by the Government of Israel would seriously undermine the urgent efforts being made by the United Nations to restore peace in the Middle East, and could not but bring about the condemnation of Israel as a violator of the principles as well as the directives of the United Nations. It is our belief that as a matter of highest priority peace should be restored and foreign troops, except for United Nations forces, withdrawn from Egypt, after which new and energetic steps should be undertaken within the framework of the United Nations to solve the basic problems, which have given rise to the present difficulty. The United States has tabled in the General Assembly two resolutions designed to accomplish the latter purposes, and hopes that they will be acted upon favorably as soon as the present emergency has been dealt with. I need not assure you of the deep interest, which the United States has in your country, nor recall the various elements of our policy of support to Israel in so many ways. It is in this context that I urge you to comply with the resolutions of the United Nations General Assembly dealing with the current crisis and to make your decision known immediately. It would be a matter of the greatest regret to all my countrymen if Israeli policy on a matter of such grave concern to the world should in any way impair the friendly cooperation between our two countries. The second full-blown crisis between the U.S. and Israel started after President John F. Kennedy took office in 1961. The clash began in 1960, when the outgoing Eisenhower administration sought an explanation for the mysterious construction near Dimona. It was told that this top-secret activity in the middle of the desert was a harmless textile plant, and no, it could not come and visit. Classified spy photos were then published on the front page of The New York Times (yes, the CIA spied on the Jewish state, with or without forged passports). When President Kennedy took office in 1961, the disagreement became a full-blown crisis. Like Obama, Kennedy was not inherently hostile, but he did not have a special sympathy for the Jewish people. His advisers urged continuous pressure, assuming that Israel would have no choice but to accept U.S. demands. Every high-level meeting or communication repeated the demand for inspection of Dimona. 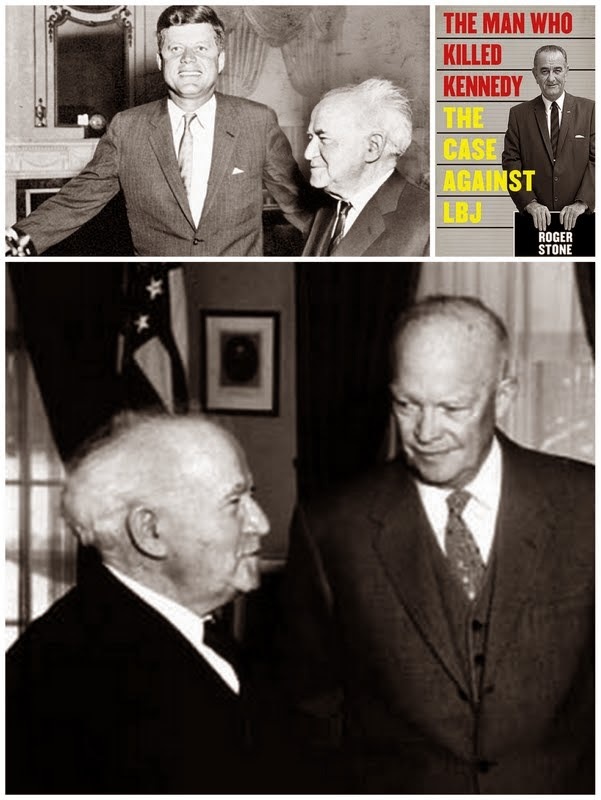 One form of pressure was to deny Ben-Gurion an invitation to the White House – his May 1961 meeting with Kennedy was a low-key affair at the Waldorf Astoria Hotel in New York, and was dominated by this issue. … If the U.S. government were to impose tax restrictions, the costs would have been very high. Ben-Gurion avoided saying no by dancing around them for two years. Finally, Kennedy had enough, and in a personal letter dated May 18, 1963, the president warned that unless American inspectors were allowed into Dimona (meaning the end of any military activities), Israel would find itself totally isolated. But then fate intervened and Kennedy was assassinated on November 22, 1963. The Israelis were off the hook. Not one of Kennedy’s successors ever even attempted to confront (or even acknowledge) Israel’s nuclear arsenal. Fifty years after his death, a scant 25% of Americans believe the official version of Kennedy’s death, according to a recent poll. The government’s story, promulgated by the Warren Commission — an investigatory body created a week after the assassination — said that a lone gunman, Lee Harvey Oswald, fired three shots, two of which fatally struck Kennedy. Oswald acted alone, the Warren Commission said, and so did Jack Ruby, the man who shot and killed Oswald two days later. In the decades since, advances in criminal forensics and technology have upheld some of the Warren Commission’s findings and cast doubt on others. In his new book – “The Man Who Killed Kennedy: The Case Against LBJ” -- Roger Stone, the sharp-dressed, rightwing political operative who is no fan of any Democrat and who worked on the Nixon, Reagan and George H.W. Bush presidential campaigns, has it in for Lyndon Johnson. Stone accuses Johnson of responsibility for nine murders, including the greatest crime of the 20th century, the assassination of John F. Kennedy. Some J.F.K. conspiracy theories blame the mafia, some blame the CIA and some blame the far right or the far left. Stone’s theory wraps together all those ideas and puts Johnson upfront as the ringmaster. “He’s the lynchpin of a conspiracy involving others,” Stone said. The third bilateral spat came after the October 1973 Arab-Israeli war. Nassar recalls Nixon and his secretary of state, Henry Kissinger, were received in Damascus by then Syrian President Hafez Assad on June 16, 1974. Assad, Nassar reports, started explaining why he accepted UNSC Resolutions 242 and 338 and his willingness to recognize Israel within its pre-June 1967 borders. Nassar suggests Kissinger interrupted the Nixon-Assad discourse under the pretext of time pressure. Nassar interviewed Nixon in New York in June 1983, when the former president dwelt on the Watergate scandal, suggesting the exclusive reports by Bob Woodward and Carl Bernstein for the Washington Post on the break-in at the Watergate office complex in Washington had more to do with Middle East politics than U.S. political affairs. Some 40 years after Watergate, Nassar remarks, former FBI agent Mark Felt revealed himself as the Watergate whistleblower but said nothing about Convicted American spy for Israel Jonathan Pollard who this month entered the 29th year of a life sentence in a U.S. prison. Israeli Prime Minister Benjamin Netanyahu is one of the most prominent critics of this week’s U.S. deal with Iran. While President Barack Obama calls the agreement a breakthrough, Netanyahu calls it a "historic mistake." And neither leader fully trusts the other. Is a fourth major U.S.-Israel crisis on the cards?